Mt. San Jacinto College has been involved in the design, development and implementation of a successful Coursera MOOC. Access materials, the course and more from this page. Check back often to see what's new! I was very fortunate to have participated in an amazing project at Mt. San Jacinto College. A massive open online course (MOOC) was created in Spring of 2013 to meet the needs of developmental English writing students in the California Community Colleges. It reached an audience of over 45,000 people across the globe in each of it's two sessions! The total enrollments surpassed 90,000 enrolled, over 60,000 participated, and over 5,000 completed with a certificate. There are many questions about this type of teaching method and through participation in the work, we hope to gain some insight into the answers. This page is a resource space for anyone interested in our ongoing work. I served as the lead in this project by authoring the grant proposal, coordinating the project, authoring unit 1, and as lead instructional designer. The distinguished project team consisted of Larry Barkley, Ted Blake, Lorrie Ross, Anna Stirling, Corinne Sheltren, Tom Merritt, Jerome Billins, Evelyn Menz, Micah Orloff, and our peer writing tutors and community TA team! To view the course, go to http://coursera.org/course/basic writing. To learn more about this course and why we created it, please visit the blog pages of this site for the "Crafting an Effective Mooc" entry. Materials and examples are at the bottom of this page. What types of online learning courses, other than Massive Open Online Courses, are available at colleges and universities. How to organize your work space and your time as an online learner. What specific behaviors and/or conditions you may need to adjust in order to be a successful online learner. How to follow the guidelines for interaction in the discussion forums for this online course. 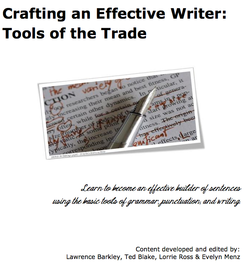 What to expect in the "Crafting an Effective Writer" course and what expectations the professors have of you! General Instructions: Below is the list of items that make up the content and activities for the week. Please do them in the order shown by clicking on the link provided in each section of the table. The suggested “Benchmark Dates” are provided to help you spread out the work and keep you from falling behind in the course. All assignments and activities are due by Monday morning at 9 a.m. (Pacific Time). Lorrie Ross, Ted Blake,Larry Barkley, and Evelyn Menz put together a resource text for the course. All of the materials are Creative Commons Licensed and can be shared with your students. Anna Stirling published this work. CEW received a 95/100 score on the Quality Matters review required by the Gates on the first review! We think this is because we designed the course by drawing from our rich experience in designing high quality traditional online courses. We used a clear unit structure and based activities on the learning outcomes identified by our English professors. One of the strengths of the course was the participation by faculty members and staff in the discussions with students. 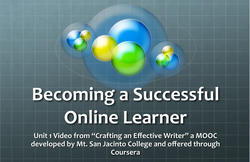 The first unit was an introduction to being a successful online learner. Each unit started with a "what you will learn" statement of outcomes and a "what you will do" ordered list of activities. You can view a sample video from the course by selecting the image of Ted and Larry, on the left. The course consisted of 5 units of study and each unit had several parts, which consisted of video lectures, reading and resource materials, assignments, and discussion forums. 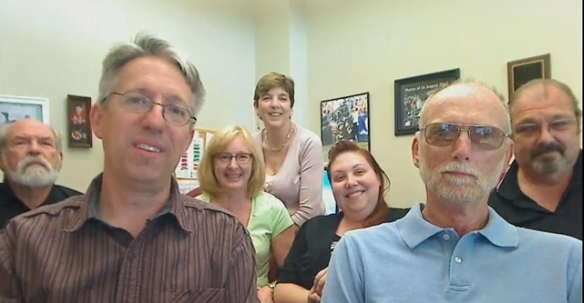 Select the image below to view our farewell video. You will be able to see and hear the team as they wrap up the first session of the course and get an idea of who we are.